When it comes to choosing chairs for your special event, the choices are endless. Why not choose an innovative and fascinating chair like the Ghost Chair. Ghost chairs are a relatively new chair in the wedding and event industry. The name clearly defines the characteristics of this chair. Like a ghost, these chairs are transparent. Ghost Chairs don't take up any less physical space, although they give the illusion of more space, making venues feel less cluttered and more open. 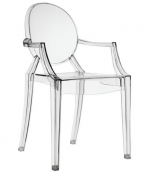 Although the Ghost Chair has an esthetically modern design, because of their transparency Ghost Chairs work equally well in both traditional and contemporary venues. Ghost Chairs are a beautiful compliment to uplighting and table linens. Colors freely reflect against the shine of Ghost Chairs. Chair Covers by Sylwia offers two different designs, suitable for any style or event theme. Need to add that extra touch of luxury? Chair covers by Sylwia can design custom monograms and patterned decals for your ghost chair rental. Contacts us today to reserve Ghost Chairs for your event!